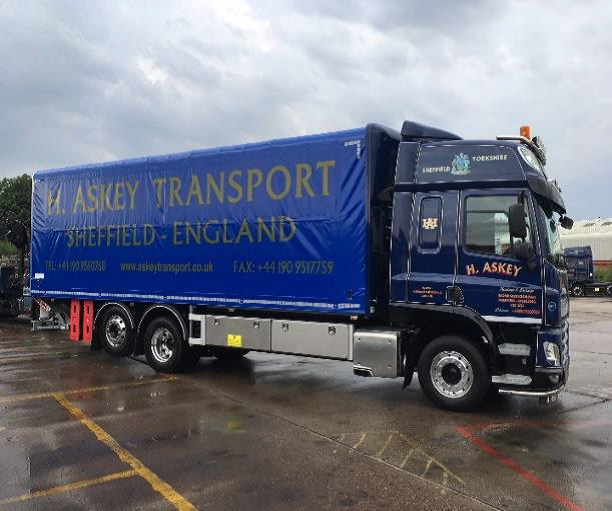 H Askey Transport has a Specialised Haulage fleet of 31 vehicles. We are based in Dinnington near Sheffield supplying standard and specialised vehicles locally, UK & Internationally. We have been Specialising in Haulage since 1946, Darren Bingham, Transport Manager, explains how FORS has helped improved performance, reduce fuel usage and improve road safety. We were first made aware of FORS through one of our key customers, who encouraged us to join the scheme. Upon investigation it was evident that the FORS standard and toolkits would help us follow best practice, improve safety and performance. FORS standards has controlled the implementation of initiatives to help improve the efficiency of operations within the company. Improvements in fuel use and safety devices on the vehicles are evident through the FORS process. H Askey Transport achieved its first FORS Bronze audit first time round in 2015 and Silver in 2018. Achieving the first Bronze audit helped us to identify and implement improvements and encourage us onto achieving Silver and then Gold accreditation. H Askey Transport has a dedicated FORS Manager that has attended the FORS Practitioner course, who emphases the need to ensure that our policies and procedures were regular review and updated. As a company we have led from the front, acting as an example to all other hauliers, showing that FORS Gold is achievable. We have managed the FORS process and by using FORS documentation have introduced a strategy last year to purchase 5 new trucks this year all with the Work-Related Road Risk (WRRR) requirements fitted as standard; The new vary from sliding curtains, Tail lift and Hiab vehicles. They all have four-way cameras with recording systems and the latest tracking devices which are used for route planning by the transport planners. After achieving Gold status last year, we have continued to review all the requirements, this means analysing the data on fuel, fines and accidents, continually training the staff and reviewing best practice. By monitoring and investigating all these areas on a regular basis will ensure that our standards have stayed at the high level required to achieve FORS gold. Over the past year we have continued to train our drivers, ensuring that they complete the required e-learning programmes through FORS. Drivers have to complete the compulsory standard CPC courses, the Safe Urban Driving course, Van smart and cycle e-learning courses ensuring their awareness of cyclists on the road whilst continuing to do their other mandatory training. All drivers are assessed annually by a trained competent person which has seen an improvement in their skills, knowledge and awareness. The result of this has seen a reduction in fuel consumption, accidents and fines. We have continued to review Penalty Charge Notice’s and any Night Lorry infringements. All the routes are planned, providing the drivers with valid information about restricted parking. If a fine is received the individual at fault has to pay the fine. The enforcement of this has led to an increased awareness amongst the drivers. We also have a more proficient recording system since achieving silver and gold awards. This has allowed us to monitor and take action, it allows us to filter out recurrent events, offenders and hotspots, whilst making drivers take more responsibility for their actions. The new vehicles are fitted with Euro 6 diesels which have had an impact in reducing our emissions foot print this year which will affect the NOx and particulates. We will be renewing our Gold status this year and have used this to help monitor our policies and standards using the FORS criteria as a guide. We passed the bronze audit first time which showed us how important it is to keep accurate records, keep policies up to speed and continually review practices. This also encourages us to put in place a training package for our staff to meet the changing demands of the transport industry. One key benefit which has helped improve the company has been the introduction of four-way cameras with recording. This has helped the drivers and the company when investigating accidents and incidents. The recorded footage has helped with a crash for cash claim and improved out insurance process. The main reason for progressing through to FORS gold was to bring the best practices that FORS offer the business. This enhanced the transport operation, in particular one of the safety requirements for the drivers is the turn left devices and camera systems. This has improved their ability to drive in London. There has been a reduction in accidents and PCN’s over the twelve months. This is a positive indication showing that staff are more aware of the requirements around London. 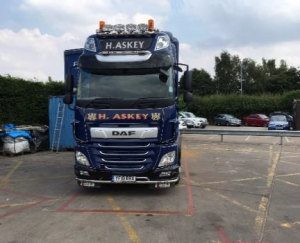 H Askey Transport carry out driving assessments / fitness reviews as well as periodic eye sight tests which are carried out every 12 months as part of FORS. We have a strong drug and alcohol policy and staff are tested on an adhoc basis. H Askey Transport strategy is to promote within the department and train van drivers to LGV and HGV driver’s positions. H Askey Transport has a stringent noise policy and reviews this regularly. Staff are reminded of this through regular tool box talks. Vehicles are fitted with night heaters to stop idling at night. Anti-idling devices have been fitted on some vehicles which ensure that the engine will cut off after ten minutes. All vehicles are washed at our depot where we have contained drainage. We are constantly reviewing environmental options and impacts to the business. This includes reviewing alternative fuels in the market place. H Askey Transport future plan is to continue to replace the fleet with the latest available technology. We are looking at alternative fuelled vehicles in the current market place. The new vehicles purchased are Euro 6 Diesels which will help with the CO2, NOx and particulate matter. We ensure all new suppliers are FORS accredited and we actively encourage that existing suppliers go from Bronze to silver. H Askey Transport already have Gold accreditation and our goal is to maintain this standard and continue to develop our staff, policies and processes. We regularly review these to meet the developing accreditation and business needs.